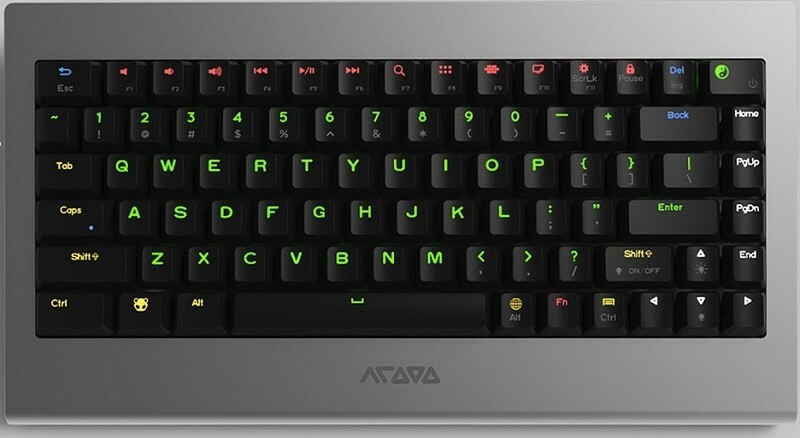 Mechanical keyboards are a top choice among PC enthusiasts and gamers alike but it’s what’s hiding underneath the keys of the oneBoard PRO+ from Acooo that’s making headlines. The board – sure to draw comparisons to the Commodore 64 – is laid out much like what you’d find on a notebook with Cherry MX black (medium stiff, non-clicky) switches. The black switches are an interesting choice as most modern keyboards opt to go a different route but then again, this isn’t your ordinary keyboard. Under the keyboard is a fully functional Android PC and as The Tech Report notes, most of the hardware lives on a removable module that should make upgrading a breeze. Current iterations feature a Rockchip RK3288 SoC with four ARM Cortex-A17 cores clocked at 1.8GHz. There’s also a Mali-T764 GPU that handles graphics through the HDMI output. Elsewhere, you’ll find 2GB of memory, 16GB of flash storage and an SDHC slot that accepts cards up to 32GB in capacity. Bluetooth 4.0 and 801.11ac Wi-Fi also come standard in addition to multiple USB ports, a DVI port and a headphone jack. It runs Android 4.4 out of the box. And yes, if for some reason you don’t want to use the Android PC beneath, the keyboard can be hooked up and used with any PC via USB. The entire setup is a bit gimmicky but in the same respect, it makes sense as any proper computer needs a keyboard. If you’ve got $299 to burn, the oneBoard PRO+ is available as of writing.